'Venus On Earth' is the latest album from the LA based band Dengue Fever. They combine Cambodian pop music with psychedelic rock and the outcome is refreshingly good. Far from severe headaches and joint pains, Dengue Fever infects you with funky baselines, fuzzy keyboards and some really great songs. With keyboards occasionally reminiscent of a sound you could hear at a fairground and Bollywoodesque vocals they certainly know how to smoothly combine an eclectic blend of inspirations. 'Venus On Earth' offers a mix of songs sung in English and Khmer which makes this album a truly unique addition to my CD collection (how any Cambodian CD's do you own?!). I recommend listening to my favorite track 'Sober Driver' to get a feel for their sound. 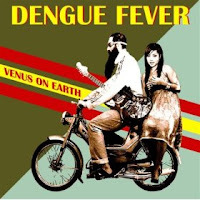 Dengue Fever was formed in 2001 by Ethan Holtzman and his brother Zac after Ethan was inspired by a trip to Cambodia. Lead singer Chhom Nimol was discovered performing at a night club in the Little Phnom Penh area of Long Beach as Ethan and Zac searched for a vocalist to sing in Khmer. Zac performs vocals and guitar, while Ethan plays the organ. Rounding out the band are bassist Senon Williams (who also plays in Radar Bros), drummer Paul Smith, and David Ralicke on brass. Many of their songs are covers of 1960s Cambodian rock tunes by such artists as Sinn Sisamouth and Ros Sereysothea, but some are originals, first written in English by the Holtzmans before being translated to Khmer. Their second album, Escape from Dragon House, was released in 2005, and contained more original songs.